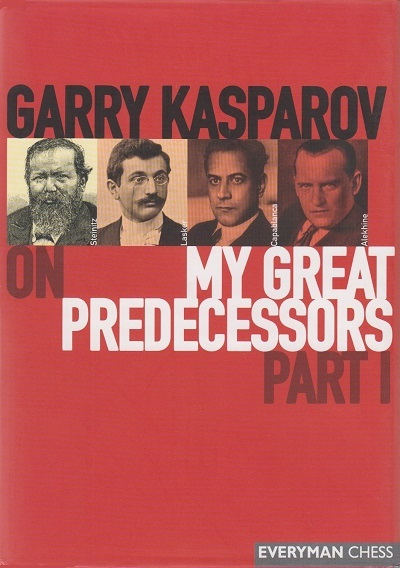 Well before Garry Kasparov on My Great Predecessors Part I was put on sale by Everyman Chess the rush had started to eulogize Kasparov’s ‘masterpiece’, to quote the term used on page 51 of the May 2003 CHESS. On page 92 of the 4/2003 New in Chess the volume was described as ‘fantastic’ by that paragon of literary criticism and historical scholarship, Matthew Sadler. Having just spent a morning dipping into the book, we offer some random jottings on, mainly, historical and editorial points. Although the book’s title page carries the words ‘with the participation of Dmitry Plisetsky’, the various textual ingredients have clearly gone through many pairs of hands on their way to the serving table. The present article falls in with the front cover’s illusion that the author/masterchef was Kasparov alone. It would, at least, seem that the Introduction (dated April 2003) was penned by him. From those egregious six pages we learn that Euwe was ‘a symbol of the age of scientific and technological revolution, the start of the era of atomic energy and the computer’, while Smyslov was ‘undoubtedly a symbol of the early thaw, the comparatively libertarian era’. Kasparov is in danger of becoming a symbol of hot air. The absence of, even, a basic bibliography is shocking in a work which claims to be ‘Garry Kasparov’s long-awaited definitive history of the World Chess Championship’, and a lackadaisical attitude to basic academic standards and historical facts pervades the book. On page 264 Kasparov writes about the 1921 world championship match conditions: ‘for the first time to the best of 24 games (later Botvinnik liked this rule and it became a standard one during the second half of the twentieth century)’. In fact, rule one of the 1921 match conditions (see page 39 of Capablanca’s book on the event) specified that the winner would be the first who won eight games; the 24-game limit would be applied only if neither player had achieved eight wins. On page 374 Kasparov states that in late 1923 Alekhine ‘set off on a tour of South America; it was time to announce himself on the “enemy” continent’. In reality, during that period Alekhine toured Canada and the United States. Leaving aside the unworthy anecdote and mangled punctuation, we would merely point out that the Cuban had also lost two consecutive games (against Lasker and Tarrasch) at St Petersburg, 1914. A stew-pot which has evidently involved a number of cooks (we nearly wrote scullions) results in the lack of a clear authorial voice. It is impossible to know who has cooked, or poached, what. Quotes bombard the reader out of the blue (without, in most cases, even the approximate year of origin, as a guide to the reader). We are asked to make do with being told that X said, or wrote, Y at some unspecified time simply because a self-proclaimed ‘definitive’ book tells us so. That may suffice for Matthew Sadler but is unlikely to appeal to those who care about decent standards of historical truth and accuracy. The lack of sources has itself hampered textual precision and translation. Even famous passages have been unnecessarily translated and re-translated. Thus page 137 quotes Capablanca as stating: ‘Pillsbury staggered everyone with the strength and subtlety of his brilliant play.’ It would not have been difficult to print his actual words, i.e. from Chapter I of My Chess Career: [Pillsbury] ‘left everybody astounded at his enormous capacity and genius’. Page 456 has the well-known description by Capablanca of Alekhine in the New York Times (1927), but for some reason the original English has not been used. Thus where Capablanca wrote that Alekhine ‘possesses a degree of culture considerably above that of the average man’, Kasparov’s book renders the remark as ‘his general maturity is significantly higher than the level of the average person’. An analogous case is the celebrated Tarrasch dictum, ‘Chess, like love, like music, has the power to make men happy’. That was the English-language translation at the end of the Preface to The Game of Chess, published in 1935, the year after his death. (The German edition of the book, Das Schachspiel, had appeared in 1931.) Pages 157-158 of Kasparov’s book offer a different English version which is, moreover, anachronistically dragged into a piece of speculation in the notes to a Tarrasch game played back in 1914: ‘Here the Doctor no doubt remembered one of his immortal aphorisms “Chess, like love and music, has the ability to make man happy”.’ Such an annotation defies logical analysis. With this carefree approach to the public record, the book frequently creates its own confusion. Page 239, for instance, has Alekhine’s well-known tribute to Capablanca (from pages 105-106 of the April 1956 BCM, although that is naturally not specified) in which he wrote as follows regarding the Cuban’s prowess in 1914: ‘Enough to say that he gave all the St Petersburg masters the odds of 5-1 in quick games – and won!’ In Kasparov’s book the quotation comes in an alternative version: ‘In blitz games he gave all the St Petersburg players odds of five minutes [emphasis added here] to one – and he won’. Why? Since no source of any kind is given, it is impossible for the reader to know. On the subject of information contained in quotations, we also wonder about the identity of the ‘Saburov’ who is described on page 349 as ‘elderly’. (P.P. Saburov was aged 34 at the time, i.e. in 1914.) Nor is it clear to us why page 364 refers to London, 1922 as the ‘victory tournament’. That is the customary title of Hastings, 1919. An early example of language/translation problems occurs on page 14, with the assertion that Labourdonnais wrote a manual entitled ‘New treatise on the game of chess’. In fact, that was a book by George Walker, whereas Labourdonnais wrote Nouveau traité du jeu des échecs. The bottom of page 356 says that Alekhine’s first book was ‘Shakhmatnaya zhinzn [sic] v Sovetskoi Rossii (Chess Life in Soviet Russia)’. As indicated in our bibliography of books by Alekhine (C.N. 1709), he wrote no volumes in Russian, and his first work was in German (Das Schachleben in Sowjet-Russland). Proof-reading and fact-checking in Kasparov’s book fall far short of what may reasonably be expected, especially in a high-profile work. That same page 356 states that Alekhine ‘would never seen [sic] his native land again’. Page 428 says that he ‘set off an a’ round-the-world-trip. Page 456 refers to his burial in ‘Montparnesse’ Cemetery. The reference to ‘his’ instead of ‘this’ match of giants on page 312 is another misprint noted during our morning’s casual browsing. The quality of the prose is erratic, with an unfortunate penchant for Reverse English in the annotations (e.g. ‘Undoubtedly more tenacious was 27…Ne5’ on page 292). The whiff of foreign cuisine is strong, and the book could certainly have done with an English grammarian. A curious case arises on page 229, with an apparent attempt to correct Capablanca’s English from My Chess Career. The Cuban’s first note to the final game of the Marshall match included the sentence ‘I liked Mieses’ ninth move, Kt-K5, and decided to play it against Marshall, who I hoped had not seen the games’. This is perfectly correct, but somebody involved in Kasparov’s book has presumed to change ‘who’ to ‘whom’. It may well be the same person who, on page 349, came up with the following: ‘The military authorities quickly sorted out who was whom’. And, indeed, the same individual who wrote on page 413 ‘Alekhine will defeat everyone who he meets’. Of the 148 games it is unlikely that a single one will be new to readers, so what counts is the quality of the annotations. Here the same laxity in quoting proper sources is manifest, with woefully insufficient account taken of earlier analysts’ work. Pages 37-39 discuss Bird v Morphy, London, 1858, but Kasparov and his helpers have paid no attention to the detailed notes of Karpov and his helpers on pages 1-10 of Miniatures from the World Champions (London, 1985). Page 64 (Zukertort v Blackburne, London, 1883) disregards the forced mate beginning with 31 Rg8+ (C.N. 2193 – see page 5 of A Chess Omnibus). Page 326 fails to credit any contemporary analyst with noting 40 Rb6 in a game from the 1927 world championship match. C.N. 2343 (see page 36 of A Chess Omnibus) pointed out that the move had been put forward by Roberto Grau on page 212 of the April 1928 issue of El Ajedrez Americano. Anyone flicking through the book may initially be impressed by the quantity of analysis, and the extensive references to other annotators, but the devil is in the detail. The edifice begins to crumble as soon as a closer inspection is made. We would be tempted to write more, but fortunately one critic, Richard Forster, has already made a detailed study of the Kasparov approach to annotation. The result was a notable article entitled ‘The Critical Eye’ at the Chess History Center website. Afterword: The above assessment appeared as C.N. 2972. Together with the follow-up items C.N.s 3027 and 3180, it was subsequently published on pages 237-241 of Chess Facts and Fables.